Click the pics for bigger photos! 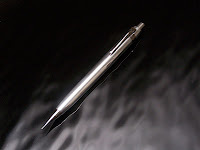 I've done many Pentel based mechanical pencils. Woods and plastics are beautiful and (generally) quite durable. But I've been wondering just what it would take to make one from metal. Having only a wood lathe, my attempts to work with stainless steel have been unsuccessful so far (but I'm still trying!) Softer metals seemed like a safe bet. So I started with aluminum since it's cheaper than brass, which I plan to tackle next. This pen in the photos is *NOT* of selling quality. It is a learning experience. And I'm pretty darn happy with the results. I drilled a 3/4" aluminum bar on the lathe using the same stepped bit I use on all my Pentels (purchased from rherrel at iap.org). It was a bit trickier than drilling wood or resin since the bit is long and slender. It tends to flex and vibrate during drilling. Aluminum also gets quite hot when drilling. At a minimum this can quickly dull the drill bit. With the aluminum clamped in my large scroll chuck, I also worried about the heat getting to the bearings. So I cooled the bit and blank with cutting oil repeatedly. Drilling took a really long time because of this, but preserving my tools was worth the effort. Next I mounted the blank on my Pentel mandrel, also purchased from rherrel, and started turning. I experimented with several different tools, including carbide metal lathe bits, and found my big roughing gouge (carbon steel... not even HSS!) to be the best at smooth cuts in aluminum. But it required very frequent sharpening to keep it cutting, and not chattering or squealing. Whatever tool I used, I had to take super light cuts. The aluminum came off in such thin ribbons that it turned to dust when I touched it. I also used a round nosed scraper to get the final finish. It worked very well, but took even less material off per pass so I didn't use it for shaping. Only to remove any ridges left by the gouge. I sanded 400-600-800 and gave it a quick buff on the felt wheel. I have a bright satin finish on it that I think suits it very well and doesn't show every fingerprint. I debated giving it a lacquer finish but decided since this isn't going to be sold, it would be good for me to use it every day for a while to see how the "finish" holds up, and what it will take to restore a beat up aluminum pen. I expect some Mother's mag wheel polish will shine it up nicely. It does look like it's done in great detail though. If it is not up to production quality, I'm sure it won't be a long way to go.